Lost Lagoon with Downtown Vancouver in the background. A view of Lost Lagoon looking North, with a swan in the foreground. 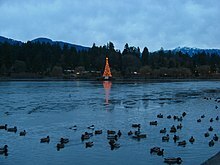 Lost Lagoon, showing Jubilee Fountain decorated for Christmas in December 2006. Jubilee Fountain in 1936. It was later restored for the Expo 86 world's fair and again in 2010. "I have always resented that jarring unattractive name [Coal Harbour] for years. When I first plied paddle across the gunwale of a light canoe and idled about the margin, I named the sheltered little cove Lost Lagoon. This was just to please my own fancy for, as that perfect summer month drifted on, the ever restless tides left the harbor devoid of any water at my favorite conoeing hour and my pet idling place was lost for many days; hence my fancy to call it Lost Lagoon. When the causeway was first proposed in 1909, an intense public debate took place over the fate of the basin. As with most of the early controversies concerning the use of Stanley Park, organized labour was pitted against the more upper and middle class proponents of the City Beautiful movement. Trade union representatives argued that the majority working class population was in need of recreational facilities, while their opponents maintained that more aesthetic or ethereal considerations should take precedence in park development. The Vancouver Trades and Labour Council was adamantly opposed to the idea of an artificial lake, and argued for it to instead be filled in for use as a sports field. The park board retained the services of T. Mawson and Associates, an architectural landscaping firm that had designed the park's zoo and many other facilities in Stanley Park. The proposal the board settled on featured an artificial lake with a sports stadium on the northwest side and a large museum on the southwest shore. The $800,000 price tag, however, proved too steep for the board's budget, and the non-lake parts of the proposal were quashed. The next phase in the lake's development came in 1929, when the saltwater pipes entering from Coal Harbour were shut off, turning it into a freshwater lake. The BC Fish and Game Protection Association was given permission to stock the lake with trout. The Stanley Park Flyfishing Association was formed, and charged members to fish in the lake, while the park board profited from the canoe and boat rentals. This came to an end in 1938 when the walkway around the lake was constructed and the area declared a bird sanctuary. Civic budgets were significantly reduced during the depression, but the park board benefited from the free labour of relief recipients, who were used to landscape Lost Lagoon. The next controversy surrounding the lake followed the proposal for a fountain to be erected in the lake to coincide with the city's Golden Jubilee anniversary celebrations in 1936. For the mayor, it would be "a miracle of engineering," with the spray of water lit by virtually "limitless combinations" of colour. The public, in contrast, were not impressed by the proposal. Its $33,019.96 price tag was considered extremely frivolous in the midst of an economic crisis. As written in The Sunday Sun Edition of the Vancouver Sun Newspaper, Saturday, August 8. 1936. The lead story in the Magazine section is; SECRETS OF THE FOUNTAIN. It was the conception and idea of then, Chief Electrical Engineer, Robert Harold Williams with Hume and Rumble Ltd. electrical contractors. R.Harold Williams designed and supervised the erection of the Vancouver's Golden Jubilee fountain. After a business trip to Los Angeles he saw a fountain and thought this would be a great gift for the city for their up and coming birthday, Golden Jubilee celebration. To build the fountain, Lost Lagoon was drained. Seventy piles were driven into the mud. On these a concrete mat was laid. The fountain was built upon this mat. The work was of necessity rushed; it was done in a month. "The fountain is worthy of all the traditions of art, worthy of Vancouver's Golden Jubilee, and it will be a permanent, decorative joy in Stanley Park". "When operating , it is like a symphony concert, in motion and color instead of music, says Harold Williams, engineer, of Hume & Rumble Ltd., under whose personal supervision the work has been done." Vancouver's Jubilee Committee and private citizens who contributed are to be commended on their work in pushing for this beautiful fountain, which is sure to be one of the major attractions during the Golden Jubilee celebration. "We've had to hurry," says Mr. Williams," in that time 285 tons of cement have been utilized and all the special equipment was built." All equipment was built in Canada and the pumps were constructed in Vancouver. All union labor was employed. It was restored for Expo in 1986. Lost Lagoon is a popular place for park users for strolling the perimeter trail and bird watching. On the southeast corner of the lake is the Lost Lagoon Nature House, an old boathouse that is now an interpretive centre for the Stanley Park Ecology Society. While rare in recent decades, Lost Lagoon can freeze during a cold spell, permitting public ice skating and ice hockey. ^ "Stanley Park Ecology Society: FAQs - Stanley Park Wildlife". Stanley Park Ecology Society. Retrieved 2009-07-23. ^ Steele, Mike (1993). Vancouver's Famous Stanley Park: The Year-Round Playground. Vancouver: Heritage House. pp. 114–115. ISBN 1-895811-00-7. ^ Johnson, E. Pauline (1911). Legends of Vancouver. Vancouver: Thompson Stationery Co. ISBN 1-55082-024-9. ^ Sheila M.F. Johnston (15 November 1997). Buckskin & Broadcloth: A Celebration of E. Pauline Johnson—Tekahionwake, 1861-1913. Dundurn. pp. 210–. ISBN 978-1-55488-112-3. Retrieved 30 July 2013. ^ Robert A. J. McDonald, "'Holy Retreat' or 'Practical Breathing Spot'? Class Perceptions of Vancouver's Stanley Park, 1910-1913," Canadian Historical Review LXV, no. 2 (1984): 139-140. ^ Steele, Mike (1993). Vancouver's Famous Stanley Park: The Year-Round Playground. Vancouver: Heritage House. p. 118. ISBN 1-895811-00-7. ^ Steele, R. Mike (1988). The Vancouver Board of Parks and Recreation: The First 100 Years. Vancouver: Vancouver Board of Parks and Recreation. p. 109. ^ Williams, David Ricardo (1986). Mayor Gerry: The Remarkable Gerald Grattan McGeer. Vancouver: Douglas & McIntyre. p. 207. ISBN 0-88894-504-3. ^ Davis, Chuck; Elizabeth Godley (1997). Fountains of Greater Vancouver. Surrey, BC: Linkman Press. p. 210. ISBN 1-896846-00-9. ^ Mathews, Doug (2000). "Lost Lagoon - A Lake for all Seasons". City of Vancouver Millennium Project. Retrieved 2006-12-09. This page was last edited on 20 July 2018, at 20:43 (UTC).